A society photographer’s assistant who fell in love with the passion, pain and glory of road cycling, Watson has spent the last 35 years taking the pictures that we know so well. Kelly, Hinault, Fignon, Lemond, Indurain, Armstrong. All are here, some in almost life-size images that do not fail to impress despite their familiarity. 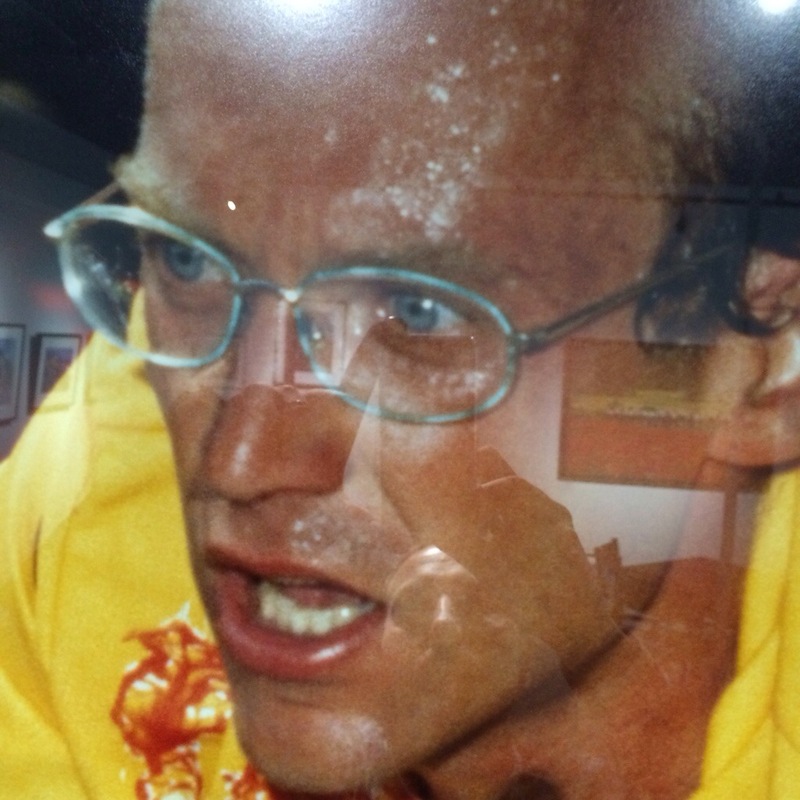 Standing eye-to-eye with a snarling Blaireau or toe-to-toe with French champion Fignon as he pours Perrier on his aching feet brings me as close as I will ever get to my childhood heroes. Graham, on the other hand, as familiar a face to me in the flesh as Delgado or Roche, got a whole lot closer. Working from February to October at the heart of the action, Watson maintains a professional distance. He doesn’t see them as heroes and somehow manages to combine his passion for the job with the objectivity that great photography needs. He works with the same motorbike driver all year and they build up a rapport about where to be and what Graham is looking for but he concedes that it’s still “about 80% luck.” The consistent high quality of his images might disagree with that. We stop by another small picture. A Histor Sigma rider is guiding a rainbow jersey’d youngster – no more than ten years old – in close formation, a caring hand on his back. 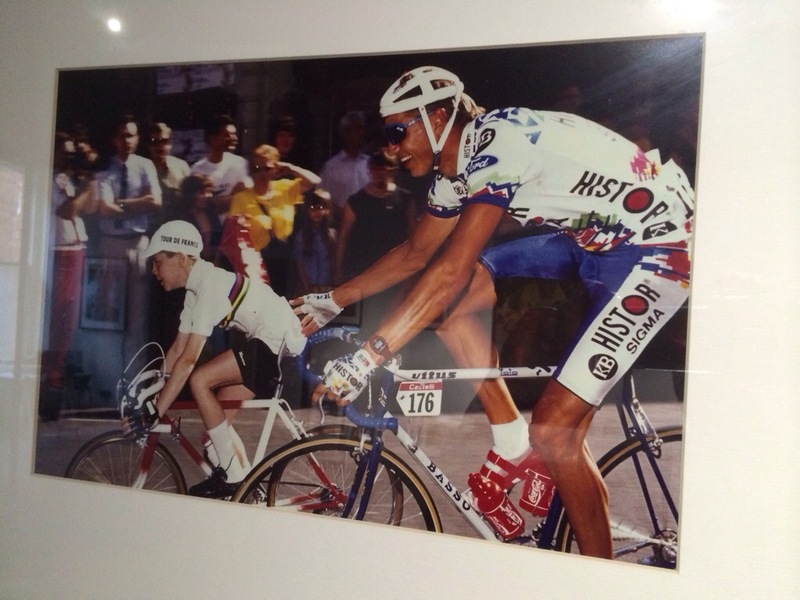 A son I presume, celebrating a win with his father, Wilfred Peeters, in the same way that Wiggins and his son did on the Champs Élysées in 2012. “No. It was just a kid.” says Graham, “A random kid who slipped into the bunch and rode with them.” It’s a beautifully striking image and a heart-warming tale. And his favourite? “Gladiators” says Graham after only the briefest of hesitations. I know the one he means. It’s in the other room so we walk through to it. Lemond & Hainaut. L’Alpe d’Huez. 1986. They are rounding one of the famous corners, eyes focused somewhere up ahead. Lemond, wearing yellow, is slightly behind. Hinault wears the combined jersey and is glaring as only Hinault can. Team mates. Rivals. Gladiators. Graham will be out again this Tour, riding amongst the action, close enough to hear the riders’ calls, close enough to smell their sweat, taking the pictures that we will see that evening, the following day, the following year. It wasn’t always such an instant process of course. “In the old days I’d just stuff the film rolls in my pockets and process them all at the end of the month. There wasn’t the same hurry. When digital first came in I started taking a mobile film processing unit with me so I could keep up but I went digital in 2004. It’s a different game now: you’d be working for one client whereas now I’ll be working for twenty.” It’s long, late work and Graham appreciates the months off at the end of the year. It doesn’t stop him coming back for more though. He seems to have the same drive, the same enthusiasm as when he was starting out. And his secret? He just a loves bike racing. Whitecloth Gallery. Aire Street, Leeds. LS1 4HT. 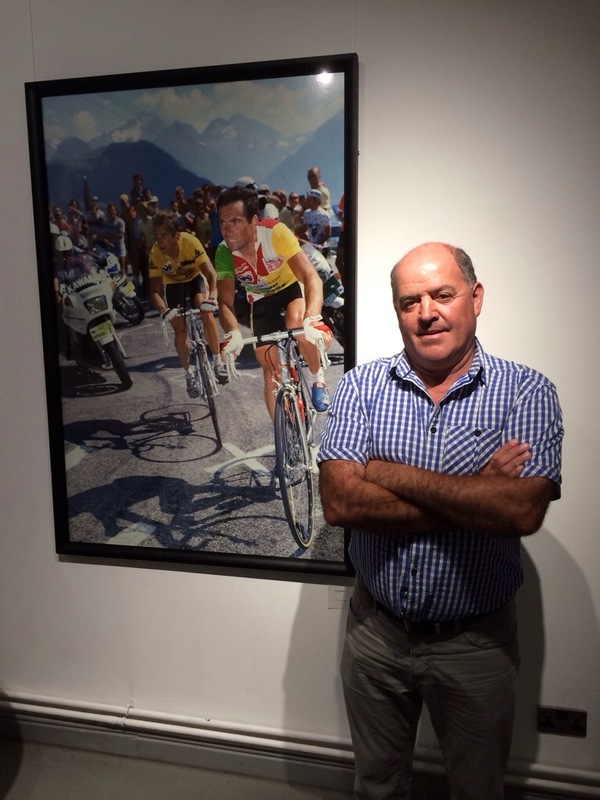 This entry was posted in Uncategorized and tagged Cycling, fignon, hinault, indurain, lemond, photography, Pro cycling. Bookmark the permalink.